Introduction: Currently accepted understanding about the role of the host inflammatory response in the progression of destructive periodontal diseases is the basis of therapeutic approaches with NSAIDs. Reduced levels of IL-1 and PGE2 in crevicular fluid and gingival tissues are measured in patients with adjunctive host modulation therapy in comparison with conventional mechanical therapy alone in numerous studies. The healing in patients with this additional therapy demonstrates successful elimination of gingival inflammation with pocket depth reduction and attachment level improvement. Aim: To investigate the effectiveness of additional host modulation therapy with NSAID (Aulin) in patients with chronic periodontitis. 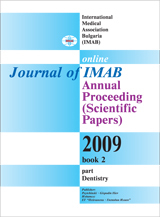 Material and methods: The study involves 14 adult patients suffering moderate to advanced periodontitis, instructed for strict daily plaque control (including personal hygiene involving interdental brushes and dental floss) and antimicrobial mouth rinsing with 0.2% chlorhexidine (Corsodyl) and is treated with scaling and root planning. On the 5th day of the treatment the patients are put on adjunctive systemic administration of NSAID (Aulin) for 14 days, twice daily x100 mg. The efficiency of the therapy is measured at its 6th week with the same clinical parameters – PD, CAL, HI, and PBI. Results: The results of the treatment depict significant shift in the distribution of shallow and deep periodontal pockets. The shallow pockets (1-3mm) in the initial status of the patients are 23.8% from all measured pockets and at the end of the applied treatment this number rises up to 75.7%. The initial level of the deep periodontal pockets (>5mm) is 9.8% and decreases to 0.5% after treatment. The quantity of pockets with moderate depth (3-5mm) decreases from 66.5% to 38.7% at the end of the evaluated treatment. Conclusion: Within the limits of this pilot study we may conclude that the additional host modulation therapy with Aulin may enhance the outcomes of nonsurgical therapy in patients with chronic periodontitis. Key words: chronic periodontitis, proinflammatory cytokines, nonsurgical therapy, NSAIDs, pocket depth.